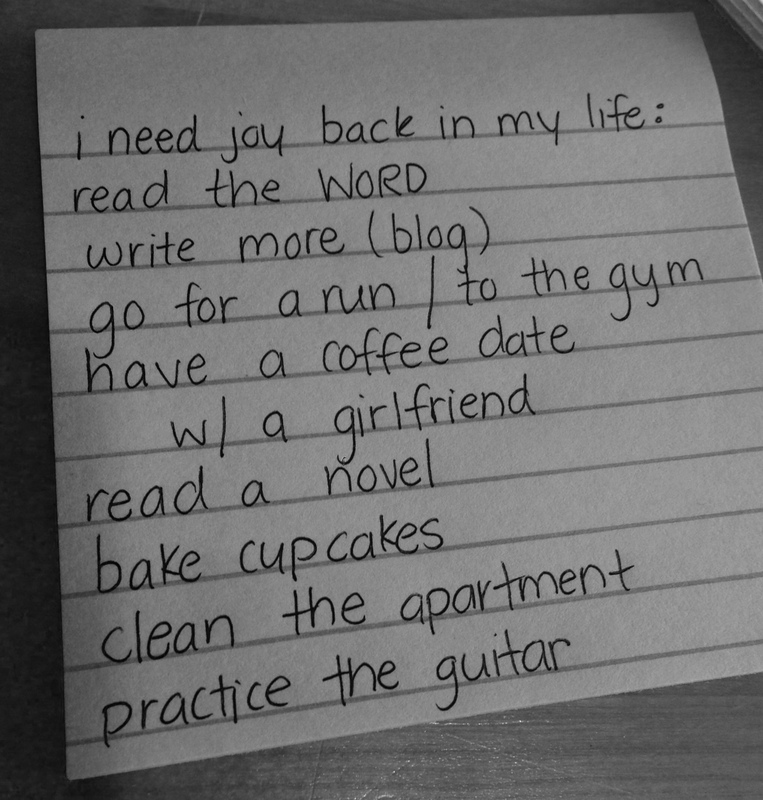 I’m such a task-oriented person, that having a list of things to accomplish often satisfies my need to feel successful. But today I had one of my recurring epiphanies that I don’t need to accomplish anything. Jesus has accomplished it all. A weight lifted off of my soul. This and last week is a blur though still. My personal life has been filled with wedding plans and spending time with friends in Fredericksburg, and and my work life has been overwhelming and filled with stress over a number of projects and new violin students. I often don’t give myself time to breathe, and when I do, I don’t feel justified in it; “I don’t deserve time off, I haven’t earned it,” is often what I think. I have trouble sitting still, so it’s a wonder I’ve been able to work in my office more the past couple of weeks. 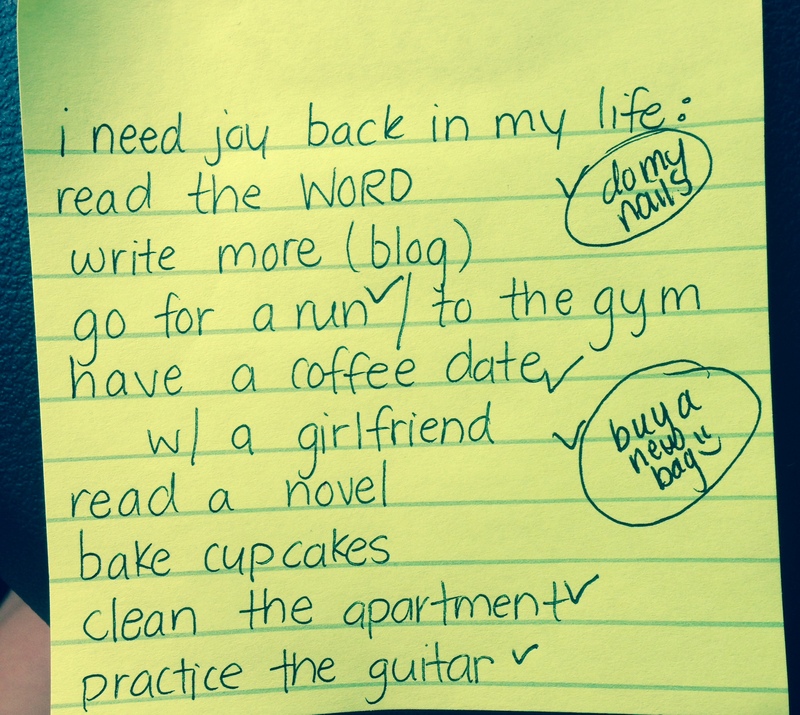 In the end though, the list only helped a little. The high of retail therapy (I bought an awesome new Scout Bag that I LOVE) and exercising only last for so long, and I eventually realized I have had a heart problem. I have felt worthless. I feel worthless at work and worthless to my fiancé. I feel like a worthless daughter who will never be good enough for her mother. I feel like a worthless employee who doesn’t do a good enough job. I feel like a worthless roommate for leaving dishes around and not being home enough. The root of my heart problem: where I was placing my worth. I should be finding my worth in Christ and not in anything else. In the end, I will let people down. I will not succeed in loving people well, as hard as I may try. I’ve been reading a lot of comments and articles that some of my friends post on Facebook (don’t start, you won’t stop), and a lot of them are from a humanistic viewpoint, which at first sounds appealing, until you realize that it will only suffice if people are perfect. And let me tell you, people (especially myself) are not perfect. In planning my wedding, I have been thinking about how I want everything to be perfect. But I have had to remember that there is no way it will be perfect. Something will go wrong, and that’s ok. Our wedding can, and will, have purpose, and that is far better. Having direction, purpose, and a focused heart is so much better than being perfect. So over the weekend, getting our first ‘Mr. 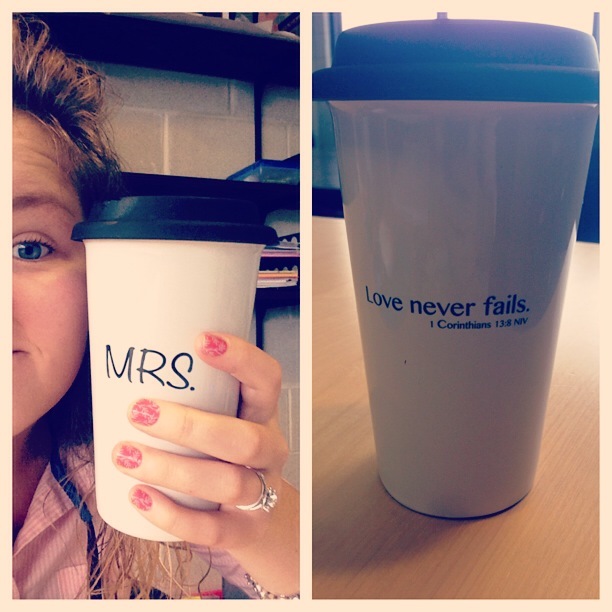 & Mrs.’ gifts, travel coffee mugs (thanks to my secret sister at church! ), I have been reminded that marriage is my next big step in learning where I can have direction, purpose, and focus. Loving my new Mrs. travel coffee mug!